I love MAD magazine and Don Martin was one of my favorite artists. He is from the golden age of MAD, the 1960's. This was a fun character, Captain Klutz. He is going to save us but he is laugh out loud funny. Great times! 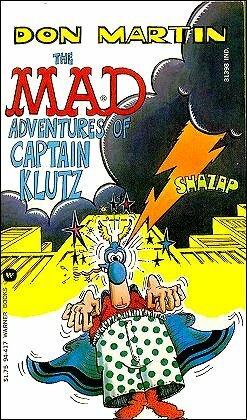 I love Captain Klutz! It is really funny. Captain Klutz got kicked out of the house because he liked to read comic books. I think it would be a great book for kids. My book is in tatters from reading it so much over the years. Everything about this book tickled me when I was a child and I still get a kick out of it today. I first read this as a child, and decades later I still have the same yellowing copy sitting like a trophy in my bookcase. It is still one of the funniest things I have ever read. Don Martin - Cartoonist and illustrator for MAD Magazine from 1956 through 1988. Known as "MAD's Maddest Artist."